up to 20 tons without being crushed or damaged.It is an ideal light to illuminate your deck, dock, stairs, or driveway. The road markers improve the safety of intersection approaches, as well as pedestrian, bicycle and other crossings. These markers enhance delineation and driver awareness, especially in low visibility conditions. This Solar LED Road Stud is naturally charged by the sun. The super bright LED’s come on automatically as soon as it starts getting dark and last for up to 72 hours. They can be seen from a distance of 800 meters. The light is ideal for illuminating paths, decks, docks, boats, driveways and roads. It is cost effective, easy to install and require absolutely no wires or maintenance. - This aluminum alloy LED road stud is naturally charged by the sun. - The light is ideal for illuminating paths, decks, docks, boats, driveways, stairways, pavements. - It is cost effective, easy to install and require absolutely no wires or maintenance. Dramatically enhance the look of your garden and yard. - They have been specifically designed with road safety in mind and can help to prevent serious accidents and emit rather than reflect light. 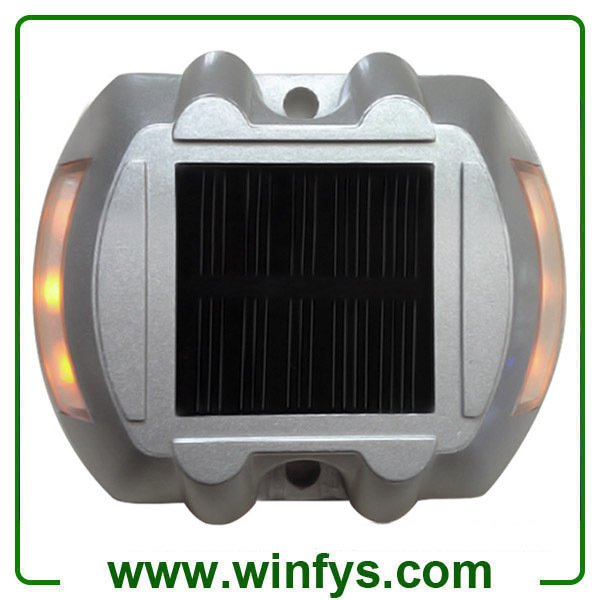 - Solar LED road studs are also know as solar raised pavement makers, solar reflective lane markers and solar warning devices. make sure it will not loose under long term pressure.